Hill Country Vista Suite offers a one bedroom suite with a grand king sized bed, a private library with a lovely view, and a bathroom complete with a whirlpool tub and stand-up shower. 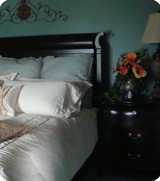 Our guests will enjoy the privacy of their own entrance and the luxury of having the complete suite all to themselves! 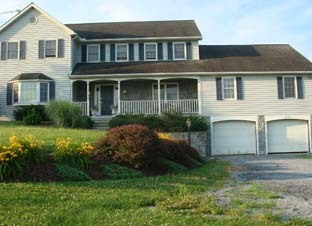 Our home is situated on a beautiful property with flower gardens and a gazebo, and is surrounded by Amish farms and fields. Enjoy a peaceful stay with all of today's modern conveniences. Checks or cash accepted if paying directly, credit cards accepted through our listing on VRBO.com - www.vrbo.com/456595. Check in time is between 3:00-9:00PM and check out is by 11 AM, unless other arrangements are made. Cancellation policy - $75.00 fee will be charged if cancelled within 30 days of your stay. PLEASE CONTACT Dan or Miriam if you have any questions at hillcountryvista@aol.com, or call us at 610-286-5373.